Prayer is a most powerful tool in seeking God’s grace and blessings. This Novena for the success and safety of the Lourdes Pilgrimage is a wonderful way for participants to prepare for the pilgrimage and a great way for those who are not attending to be linked spiritually to those who will be there. The Novena is recommended to be said for the nine days leading up to the departure of the charter plane for Lourdes. 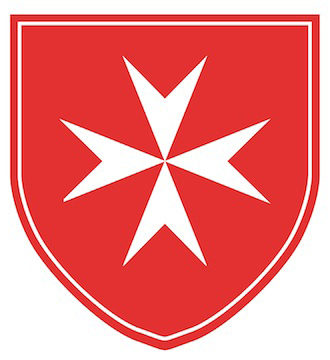 It can also be said, beginning on the day of the charter flight to Lourdes and ending on the day of the charter flight returning from Lourdes. Of course, this novena can be said anytime. Click here to download the Novena. Thus spoke the cynical voice of a doubting age. God has been shouldered out of His universe. There was no place for Him in the exclusive little system that man had developed to his own complete satisfaction. Men looked to earth and hoped to make it their heaven. Women embraced love that was not love and wondered why their hearts were hungry. There were wars and famine, cruelty and greed, lust and disbelief in God and in man…and heaven and Mary very far away. O God, who by the Immaculate Conception of the Virgin prepared a worthy dwelling place for your Son, we humbly beseech you that we, who celebrate the apparition of the same Blessed Virgin, may obtain health of soul and body through the same Lord Jesus Christ, your Son, who livest and reignest with you in the unity of the Holy Spirit, God, world without end. Amen. The world around the little Bernadette was an old world and a blind one. Men knew too much of selfish love to understand the real meaning of love. They hugged money so closely that they had lost their sense of values. Losing faith in mankind, they had thrown away their faith in God. Finding sad and ugly the new earth they had tried to make, they disbelieved in heaven. But not the little Bernadette. Fresh from her first communion, her rosary her only jewels, surrounded by a poverty that had not lost its faith and by labor that had remembered to offer itself to God, she found the barren rock and saw there the wonderful Lady. There were stars in the Lady’s hair and roses on her feet. There was a smile on her lips and mercy in her hands. “I am the Immaculate Conception,” she said, gently. And Bernadette knelt, as countless multitudes of adorers have knelt, ever since then, before the Mother of God come back to bring her Son anew to earth. Kneeling beside Bernadette, we say: The Prayer of Our Lady of Lourdes. Heaven often seems very far from earth. Clouds that roll close to earth are usually dark and threatening. The warm, soft-light of the springtime sun is distant and pale. When faith is strong, it yearns for heaven with a yearning that makes heaven seem utterly desirable and too long delayed. When faith is weak, heaven fades away. Few ages have pushed heaven farther from it then had the age of Bernadette. God had been told-and none too politely-that He had no place in the business or politics or literature of the world. A thousand false religions were too deeply concerned with reforms here and now to care about reforms that lasted forever. Heaven and earth seemed to unite in her lovely person. Gone for twenty centuries, she was young with eternal youth. If she wore about her head a crown of heaven’s stars, she wore on her feet the roses of earth. She spoke the thoughts of eternity in the language of time. She who had been a creature brought with her the power lent by the creator. Always it is found that faith is strong and doubt is weak and fragile. Doubt is negative and lonely; faith is positive, charged with a great hope that shares itself. Doubts die, a thousand in a generation. The one true faith is reborn in a million hearts each year of each age. So under the rock of Lourdes faith was reborn in a doubting generation. They who had not believed the compelling word of Christ believed in signs and wonders. A fountain that showed no signs of failing burst from the dry earth. Thousands flocked to see a Lady they could not see and hear words that she spoke only for a little girl. Men found their sight, and children were given the power to walk. Blind souls looked up to see that God does live and life is full of meaning. And unbelievers returned with faith and hope and love. Faith built upon the rock a mighty basilica and called from across the world unarmed and powerful armies of believers. Mary’s sons and daughters came to love her, their mother in heaven, with a greater love because she had come to earth to find them. Holding her hand, they walked back to her welcoming Son. Miracles can be of vast importance. They serve to place the seal of God upon His truth, marking His great teachers as truthful, stamping as authentic the teachings of Christ and His Church. Sudden manifestations of God’s almost careless gestures of power and authority, miracles jolt men from their trivial preoccupations. The dead rise to life. Eyes born blind are open to full vision. Withered limbs leap and dance. So it was that the miracles of Lourdes were first miracles that struck the bystanders and brought doubters to their knees. The ordinary waters of the spring, commonplace by chemical test, could work wonders in sick bodies. The passing of the Blessed Sacrament was like passing the divine physician. Men, who though without faith, came to lay their illnesses before a Godin whom they did not believe knew His power and rose to acknowledge Him. Mary had indeed brought to Lourdes her Son, Christ the healer. Great as was the miracle by which He raised Lazarus from death, the miracle by which He drove seven devils from the soul of Magdalen and turned the harlot into a woman of pure love and lifelong penance was even greater. Always those miracles of Lourdes that heal the sick will be the more spectacular. But the miracles that are the very core of the shrine’s meaning are the miracles that touch the soul. Cynicism, blind and unfeeling, comes contemptuously prepared to be amused and…kneels, open-eyed and believing. Sin, hugging to its heart the disease that has slain the soul, suddenly knows its fetid death…and rises to new life. Physicians, knowing the limitations of their own powers, bow humbly before the greater power that flows upon sickness here. And over the world Catholics lift their heads with the new pride as their Church in this day is marked with the wonder of God’s intervention and Mary lives to give her suffering children happiness and a return to health. Where in all this is the little girl Bernadette? What happened to her after the Lady had appeared to her for the last time and the world had come to believe the lady? God’s ways are strange, and yet they are often of a pattern. The little girl had known the happiness of looking upon Mary of the Immaculate Conception. Now God closed her away from the world in a convent. Her name became Sister Mary Bernard. Never again did she visit Lourdes, though year after year thousands upon thousands of others came to the spot where she had first seen the fair and wonderful Lady. With all the splendor of Catholic ritual, the great Basilica, man’s artistic tribute to the God who made the beauty of the universe, is opened. Bernadette is not present. For her there are no more miracles. No honors come to her. She leads the life of an obscure nun. She does her quiet duties and dies her quiet death. Wisely did God shield her from acclaim and public curiosity to make her a simple saint of His Church. Only then does God speak again: Through His Church, He proclaims her a saint, lifting her to the altars. Sometimes a single wonder belongs to a single day. Then it fades and is forgotten. Not so the wonder that is Lourdes, or the glorious apparition of the lovely Lady of Lourdes. Today and every day since the Lady appeared to Bernadette, miracles mark the presence of God at Lourdes. Men and women of all the nations walk in procession, lifting their voices to honor God’s Mother and to acclaim the humble king who is her son. In a sort of unity of the human race, the races and colors of the world meet and blend before the shrine of mankind’s one universal Mother, and find brotherhood in the brotherhood of her Son. Mary still smiles from the grotto of Lourdes. Christ still walks in Eucharistic procession among His afflicted. He passes among them as truly as He mingled with them in Judea and Galilee, ministering to them. Mary truly brings her Son back to us. God is very near His people in the place where His mother smiled upon a little girl and with children told the beads of the Rosary. It is strange that with all the beautiful buildings in the world one of the most famous and glorious structures should be a rough grotto carved by wind and weather and sanctified by the brief presence of a lovely lady. 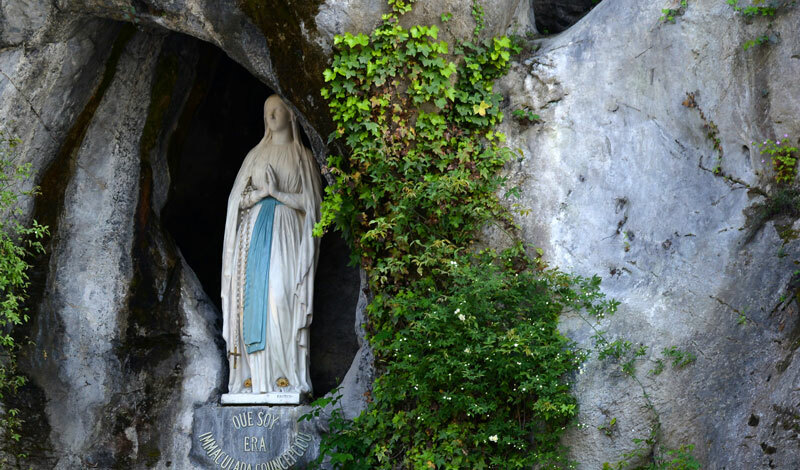 Ugly in outline, rough in texture, the grotto of Lourdes has become one of the dearest spots on earth. Because we cannot always travel to it, we have reproduced it in every city in the world. It is the focal part of convent gardens. It is the dearest meeting place of a great Catholic university. It gathers around it children in school yards. The grotto of Lourdes has found its way into our churches. It stands as the chief ornament in many a great basilica. In miniature it is the lovely little shrine in private rooms, in study halls, in auditoriums, in small chapels, on ships, in camps. For in that little grotto, that hallowed bit of ugly rock, God again manifested His love for mankind and Mary came to smile upon her children. The roughness of the stone contrasts with the gentleness of the miracles. The very ugliness of the outline serves to bring into stronger relief the charm of her who is its apparition.